SKF NOTE: The photo here shows Doug Clifford in concert in 1969. However, there are no details on the displayed drumset cited in this news report. A unique exhibit looking into the history of drums debuts in Phoenix on Saturday. PHOENIX — The Musical Instrument Museum in Phoenix is opening up its Beyond the Beat exhibit and curator Cullen Strawn said he and his fellow curators at the museum are responsible for putting the entire exhibit together after about a year of work. ….Strawn said visitors will see a history of percussion instruments unlike any other. “It’s all about drums from all over the world, the different ways they’re made and played, different shapes and sizes, the different context in which they’re used and the many meanings that they can have on people’s lives,” Strawn said. Some of the instruments on display include contemporary drum kits, such as the 1969 drum kit used by Creedence Clearwater Revival drummer Doug Clifford…. 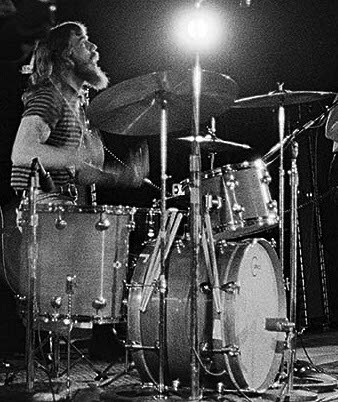 This entry was posted in Drum/Music News and tagged Camco, CCR, Creedence Clearwater Revival, Doug Clifford, Drummer, MiM, Musical Instrument Museum, Scott K Fish. Bookmark the permalink.